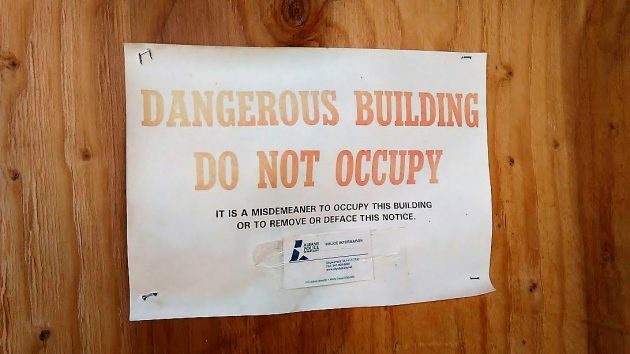 One of the city’s notices on the condemned and boarded-up houses at Fourth and Calapooia. The request for permission to demolish three old houses at Fourth and Calapooia, a contentious issue, will come up for a public hearing before the Albany City Council on Oct. 10. Council meetings start at 7:15 p.m., and the hearing on Oct.10 will begin shorty after that. City Manager Peter Troedsson announced the date in his weekly memo to the council at the end of last week. The council had voted to take case after the Albany Landmarks Advisory Commission rejected the request. The landmarks decision had the effect of delaying a possible demolition until at least July 9, 2019. Four members of the council, a majority, don’t think the owners of the property should have to wait that long. They voted on Sept. 12 to hear the case without the owners having to file and pay the fee for an appeal. 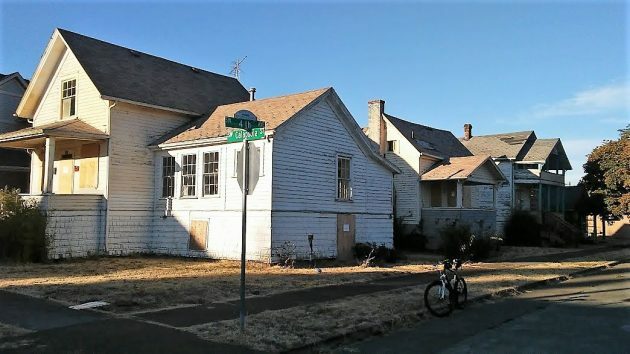 The Siegners hoped to either renovate the structures or replace them with modern dwellings compatible with the neighborhood, which is part of the Monteith Historic District. They applied for $1 million in urban renewal loans to help pay for renovating the houses and adding four garages and two apartments on the the back of the property, but their application was rejected. That’s when they applied for permission to raze the houses because without financial aid, restoration is not economically feasible. The houses at issue, at the end of July. Lundy has a good eye. Misdemeaner could be interpreted several different ways. However, there are dozens of highly skilled attorneys who will gladly take your misdemeaner case – with the proper financial incentive. I love your catching the spelling error in that posted sign in Hasso’s photo. I think I know who you are. Hope you are doing well. Thank you! I worked with HH for 22 years at the Democrat-Herald and am now doing well writing research news for OSU. Interesting notes on the Calapooia House being built either for Dr. Hill”s daughter or by Dr. Hill. We own the house directly next door and we”ve been told from the very beginning of our ownership (1995) that our house was built by Dr. Hill for his daughter. This was information given to us by the City themselves. I”m wondering if this information was supposed to be for our house instead of the one owned by the Seigners. On a side note, we would love to see the interior of the Calapooia house and talk to the Siegners to see if they would ever consider diving the lot and selling the Calapooia house. I just have no idea how to get a hold of them. Why is the City Council dragging their feet on the three homes but can’t help a historical church that is a community treasure?